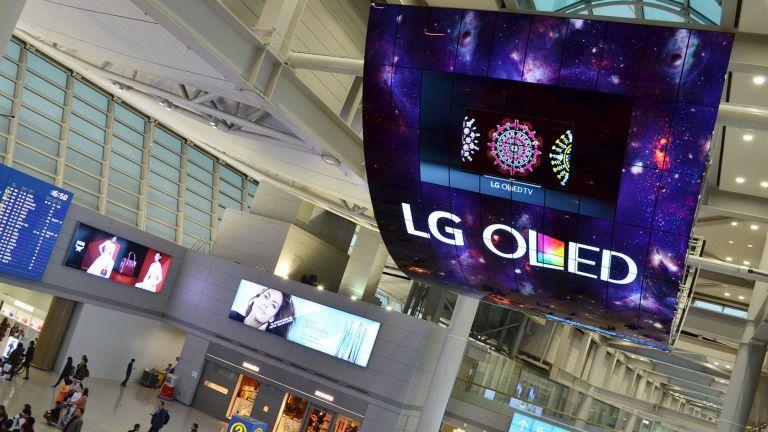 LG has recently unveiled two of the largest OLED displays in the world at South Korea's Incheon Airport. To show the world the power of OLED technology LG has strung up two displays in the airport that each consist of 140 55- inch curved OLED panels- the equivalent size of three large shipment containers. Measuring 8 metres across and 13 metres tall LG are showing travellers to the airport the magic of OLED technology such as fireworks set against a night sky. Because every pixel emits its own light there's no need for backlighting making the structure incredibly light, allowing them to dangle above thousands of passers-by with minimal support. “While the world's largest OLED sign is certainly something to be proud of, we are more excited about the opportunity to introduce travellers from across the world to the magic of OLED,” said Ro Se-yong, senior vice president and head of business-to business solutions at LG Electronics. Although OLED technology is becoming cheaper for the average consumer, its still relatively unaffordable considering you can bag a 4k 40 inch TV for under £400.